PPFMs have emerged as key internal and external governance documents for the management and regulation of with-profits funds as boards must ensure that financial management practices are in accordance with PPFMs. This book presents the results of the special corporate governance arrangements of financial services firms. Management accountants have a role not only in the development and operation of systems producing PPFM information but will also need to use PPFM information to understand and compare financial performance. 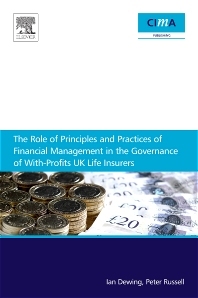 • A significant contribution to the research literature on the regulation of the UK financial services industry and on the special corporate governance arrangements of financial services firms. • A greater knowledge of the development, use and perceived efficacy of principles and practices of financial management (PPFMs) will enhance the understanding of management accounting and reporting at varying levels of complexity so enabling management accountants to use PPFM information to understand and compare financial performance. • Enables Life Assurers to comply with the requirement by the Financial Services Authority to prepare and publish a document called 'Principles and Practices of Financial Management' which also has to be in a 'consumer friendly' version. Management accountants and actuaries involved in the financial management of with-profits funds; directors of firms, including non-executive members of key board sub-committees; regulators; The Financial Reporting Council (FRC), trade and professional bodies, government and academics and others with an interest in corporate governance policy-making and implementation; accountants working in the financial services industry.